Tol2in medaka: why is the transpositional activity low? The medaka fish Tol2 element is an autonomous transposon that encodes a fully functional transposase. The transposase protein can catalyze transposition of a transposon construct that has 200 and 150 base pairs of DNA from the left and right ends of the Tol2 sequence, respectively. These sequences contain essential terminal inverted repeats and subterminal sequences. DNA inserts of fairly large sizes (as large as 11 kilobases) can be cloned between these sequences without reducing transpositional activity. The Tol2 transposon system has been shown to be active in all vertebrate cells tested thus far, including zebrafish, Xenopus, chicken, mouse, and human. In this review I describe and discuss how the Tol2 transposon is being applied to transgenic studies in these vertebrates, and possible future applications. The Tol2 element was identified from the genome of the medaka fish (Oryzias latipes), a small fresh water teleost. The sequence of Tol2 is similar to those of transposons belonging to the hAT family, namely hobo, Ac and Tam3 . Although vertebrate genomes contain a large number of sequences related to DNA transposons, including those similar to the hAT family transposons, none of these has been shown to be naturally active, and all are thought to be non-autonomous elements. In an exception, the Tol2 element was found to be autonomously active . The autonomous Tol2 element is about 4.7 kilobases (kb) in length and contains a gene encoding a transposase protein, which consists of four exons (Figure 1) . mRNA transcribed from the gene has the capacity to synthesize a protein of length 649 amino acids, and the transposase protein is fully functional and can catalyze transposition of a non-autonomous Tol2 construct (a construct containing a deletion in the transposase coding region but retaining the Tol2 ends) [3, 4]. Tol2 integrates as a single copy through a cut-and-paste mechanism, and it does not cause any rearrangement or modification at the target site except for the creation of an 8 base pair (bp) duplication. Therefore, 8 bp direct repeats are always seen adjacent to integrated Tol2 elements . The structures of the Tol2 transposable element and the minimal Tol2 vector. At the top of the illustration is the 4,682 base pair (bp), full-length Tol2. RNA transcribed from Tol2 that encodes a transposase protein  is shown by lines (exons) and dotted lines (introns). Black boxes and gray boxes represent coding regions and untranslated regions, respectively. Black arrowheads in boxes at both ends indicate 12 bp terminal inverted repeats (TIRs). The lower portion of the figure shows the minimal Tol2 vector with the green fluorescent protein (GFP) expression cassette. The minimal Tol2 vector contains 200 and 150 bp of DNA from the left and right ends, which include TIRs (black arrows) and subterminal regions (open boxes) . The transposon vector can carry a DNA fragment, for example the GFP expression cassette in this figure, between these sequences. Minimal Tol2 cis sequences necessary for transposition were recently studied [5, 6]. Transposon constructs containing 200 bp and 150 bp of DNA from the left and right ends, respectively, could transpose, but constructs containing less than 150 bp and 100 bp of DNA from left and right ends did not . Thus, the 200 bp and 150 bp sequences, which contain 12 bp terminal inverted repeats and subterminal regions, are sufficient for transposition (Figure 1). Theoretically, any foreign DNA fragments can be cloned between these sequences. What, then, is the maximum size of DNA that can be carried by the Tol2 vector? At present, we know that the Tol2 vector can carry a DNA insert as large as 11 kb between the ends without reducing its transpositional activity . Thus, the Tol2 transposon vector has the potential to carry fairly large DNA inserts, in comparison with the possible size limitation observed in a Tc1/mariner-type transposon . Zebrafish is an excellent model animal in which to study vertebrate development using genetic approaches. Transgenesis is an important means to study the function of genes in vivo, and methods to create transgenic zebrafish have been developed. First, a plasmid DNA injected into fertilized eggs is integrated into the genome and is then transmitted through the germ lineage . This method has been applied to create transgenic fish that express green fluorescent protein (GFP) in specific tissues and organs [9–11]. However, the frequency of germline transmission of the injected DNA has been low (only about 5% of the injected fish can produce transgenic offspring). Second, a pseudotyped retrovirus injected into blastula-stage embryos generates chromosomal integration of its cDNA, and the proviral insertion is transmitted to the F1 offspring . 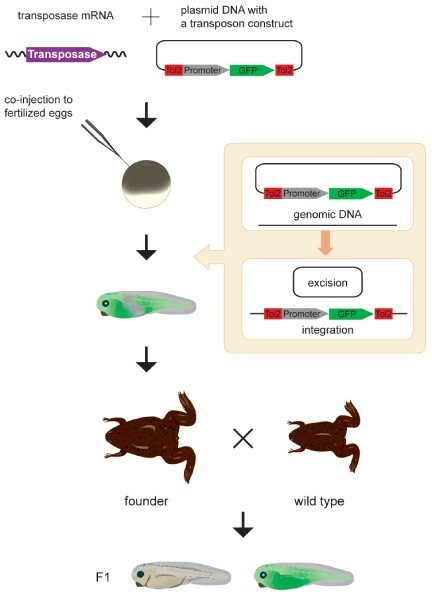 With this method, about 100% of injected fish can become germline transmitting founder fish, and therefore a large number of proviral insertions can be created very efficiently . However, the handling and modifying of retroviral vectors is laborious, making it difficult for some laboratories to establish the transgenesis method using the pseudotyped retrovirus. In the light of these limitations, the transgenesis method using Tol2 was developed. 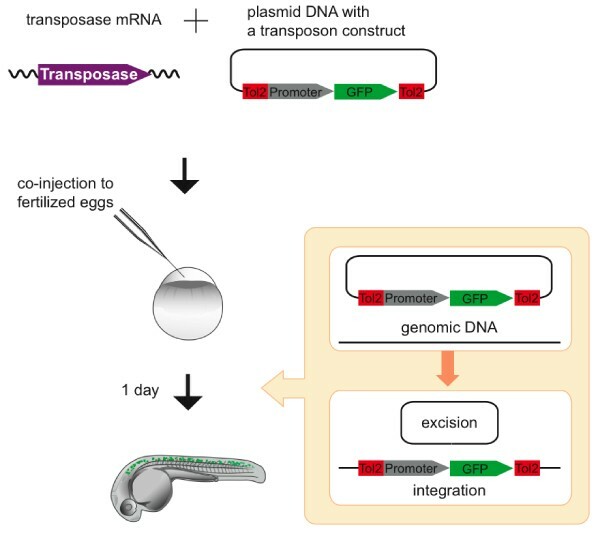 In this method, first a transposon-donor plasmid and synthetic mRNA encoding the transposase are introduced into fertilized eggs by microinjection. Then, the transposase protein is translated from the injected mRNA and catalyzes excision of the transposon construct from the donor plasmid, leading to stable integration of the excised DNA in the genome (Figure 2). The injected mRNA and the transposase protein gradually degrade, and, after transposase activity has ended, the Tol2 insertions become stable. It may be possible that the transposon construct hops around until the transposase activity disappears, although such events have not been detected. The integration events occur during early stages of embryonic development, and some occur in cells that give rise to the germ cells. By outcrossing the injected fish, germline transmission of Tol2 insertions can be selected in the F1 generation (Figure 2) . On average, transgenic F1 offspring are obtained from 50% to 70% of the injected fish, at frequencies of 3% to 100% [5, 14]. These frequencies are significantly greater than those observed with transgenesis by plasmid microinjection. Transgenesis in zebrafish. The synthetic transposase mRNA and a transposon donor plasmid containing a Tol2 construct with a promoter and the gene encoding green fluorescent protein (GFP) are co-injected into zebrafish fertilized eggs. The Tol2 construct is excised from the donor plasmid  and integrated into the genome. Tol2 insertions created in germ cells are transmitted to the F1 generation. Germ cells of the injected fish are mosaic, and, by crossing the injected fish (founder) with wild-type fish, nontransgenic fish and transgenic fish heterozygous for the Tol2 insertion are obtained . In this figure, the promoter is tentatively defined as a spinal cord specific enhancer/promoter and the spinal cord of the embryo is depicted in green. Although the frequencies are lower than those with retroviral vectors (nearly 100% of the injected fish can transmit proviral insertions to F1), the Tol2 transposon system has advantages over the pseudotyped retrovirus system because it is much easier to handle and manipulate Tol2 constructs. This is illustrated by several recent developmental studies in which Tol2-mediated transgenesis has been successfully applied. 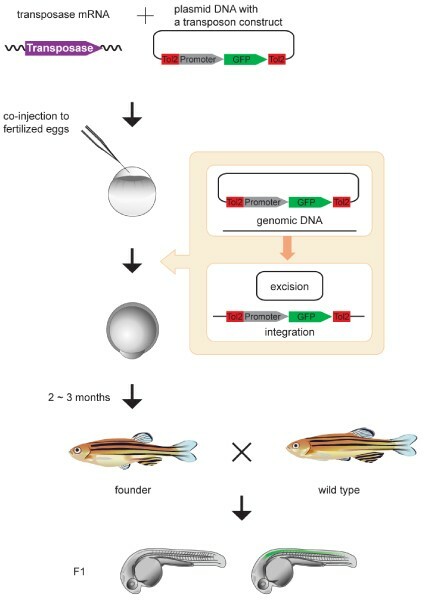 For instance, the zebrafish red-light blind mutation pob (partial optokinetics response b) was rescued by stable transgenic expression of the wild-type pob cDNA under the control of the EF1a promoter . Also, gfp was expressed in melanophores by using the Fugu tyrp1 (tyrosinase-related protein 1) promoter , in primordial germ cells by using the askopos gene promoter and the nanos1 3'-untranslated region element , and in oocytes to study the cis-acting element that controls RNA localization . Finally, the fezl gene was expressed under the control of heat-inducible Gal4 and the GAL4 responsive UAS sequence to study forebrain development . These studies reveal that Tol2 transposon insertions can mediate reliable gene expression under control of a variety of regulatory elements in transgenic fish. Importantly, expression from the transgene persists through generations, suggesting that transgenes created by Tol2-mediated transgenesis may not suffer from gene silencing effects. Furthermore, gene trap and enhancer trap methods have been developed by using the Tol2 transposon system in zebrafish [14, 20, 21]. These approaches require creation of a large number of insertions of a gene or an enhancer trap construct, and were made possible by key properties of Tol2, namely the high efficiency of germline transmission and the ease of handling and manipulation. Thus, the Tol2 transposon system should facilitate functional analyses of cells and genes during development. It can be expected that the Tol2 transposon system will be applied to large-scale insertional mutagenesis. To establish whether this is feasible, it will be necessary to determine how efficiently Tol2 insertions can disrupt the function of zebrafish genes. When DNA is injected into zebrafish fertilized eggs, the injected DNA is unequally distributed in the embryo and, in most cases, is not integrated in the genome, remaining as extra-chromosomal DNA . It was observed that embryos that are injected with a plasmid DNA containing gfp under the control of a ubiquitous promoter exhibit transient expression only in a small number of cells . In contrast, when the same GFP expression cassette was cloned in a Tol2 transposon vector and injected into fertilized eggs with the transposase mRNA, GFP was expressed ubiquitously throughout the body . The explanation of this observation is that the transposon was integrated in the genome during early stages of embryonic development in many cells through transposition. In this context, it is predicted that if a cell-type specific enhancer/promoter were to be placed upstream of gfp on a Tol2 construct, then GFP should be expressed in a cell-type specific manner in the injected F0 embryos, following the cell specificity of the cloned enhancer/promoter. One important application of Tol2-mediated transient expression is functional analyses of noncoding sequences and cis-regulatory elements in the vertebrate genome. Although it is important to understand the roles played by cis elements in gene regulation and disease, no cost-effective method to conduct large-scale analysis has been developed. Using a Tol2 transposon construct containing a minimal c-fos promoter and the gfp gene, the potential regulatory activity of genomic DNA fragments has been examined by cloning them upstream of the c-fos promoter. The transposon construct and the transposase mRNA were co-injected into one-cell stage embryos, and GFP expression was analyzed in the injected F0 embryos. It has been shown that this transient expression assay is useful in detecting chromosomal enhancer activities (Figure 3) . 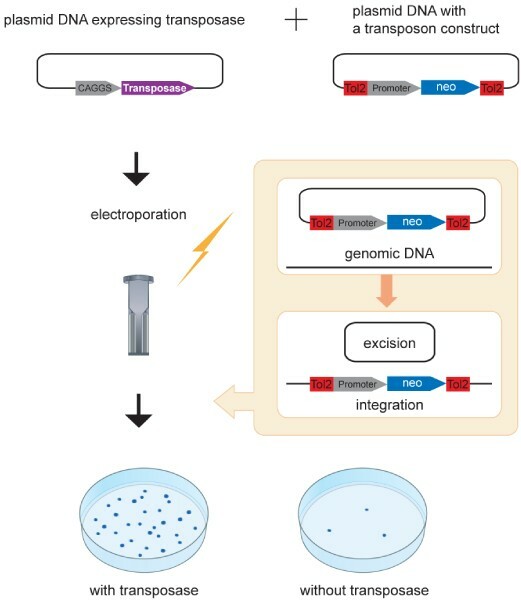 Because this method can rapidly detect activities of noncoding genomic DNA fragments, it was applied to the identification of discrete enhancer elements in the zebrafish and human RET genomic regions . However, it remains to be determined whether this transient expression assay can be applied to detection of enhancer activities that direct gene expression in any cell type, for instance very limited and specific cell types such as specific neurons. Transient expression assay in zebrafish. The synthetic transposase mRNA and a transposon donor plasmid containing a Tol2 construct with the tentative spinal cord specific enhancer/promoter (Figure 2) and the gene encoding green fluorescent protein (GFP) are co-injected into zebrafish fertilized eggs. The Tol2 construct is excised from the donor plasmid and integrated into the genome of somatic cells. The activity of the enhancer can be visualized in the injected embryo, because GFP is expressed predominantly in a region where the enhancer/promoter should activate transcription . Xenopus laevis has been a useful model animal in developmental biology. Recently, Xenopus tropicalis, a relative of X. laevis, is becoming an important model frog. It is amenable for use in genetic studies because of its unique features in comparison with X. laevis, specifically its diploid genome, smaller body size, and shorter generation time. Transgenic X. tropicalis have been constructed based on the restriction enzyme-mediated integration technique, which requires careful treatments of eggs and sperm . To develop an alternative and simpler method for creating transgenic X. tropicalis, the activity of the Tol2 transposon system was tested in Xenopus. First, both a Tol2 transposon-donor plasmid and the transposase mRNA were introduced into two-cell stage X. tropicalis and X. laevis embryos by microinjection. The transposon construct was excised from the donor plasmid, indicating that the Tol2 transoposon system is active in these Xenopus spp. . Second, a donor plasmid that harbored a Tol2 construct containing the GFP expression cassette was co-injected with the transposase mRNA into one-cell stage X. tropicalis embryos, and GFP- positive F0 frogs (30% to 40% of the injected embryos) were raised to adulthood. GFP-positive F1 progeny were produced by 30% to 40% of such F0 adults, indicating that the Tol2 transposon system can be used for transgenesis in Xenopus (Figure 4) . However, the germline transmission frequency is still lower than frequencies in zebrafish transgenesis, in which more than 50% of injected F0 fish constantly transmit transposon insertions to the F1 generation, even without pre-screening of the F0 injected fish for GFP positives. Therefore, in Xenopus improvement in transgenic frequency will be important in making the Tol2 transposon system a more powerful genetic tool. Transgenesis in Xenopus tropicalis. 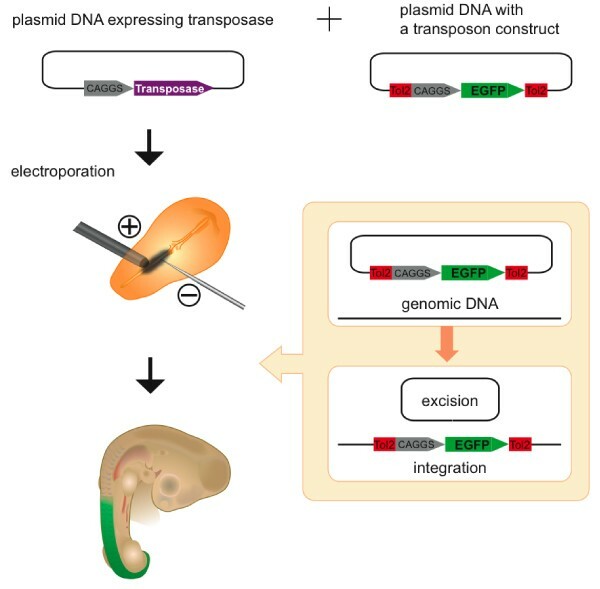 The synthetic transposase mRNA and a transposon donor plasmid containing a Tol2 construct with a ubiquitous promoter and the gene encoding green fluorescent protein (GFP) are co-injected into X. tropicalis fertilized eggs. The Tol2 construct is excised from the donor plasmid  and integrated into the genome. In the study conducted by Hamlet and coworkers , injected GFP-positive tadpoles were raised to adulthood. Tol2 insertions created in germ cells are transmitted to the F1 generation. Germ cells of the injected frogs are mosaic, and, by crossing theinjected frog (founder) with wild-type frog, nontransgenic tadpoles and transgenic tadpoles heterozygous for the Tol2 insertion are obtained . The chicken has been used as a model system to study vertebrate development mainly because of the ease of manipulation of the embryo. To facilitate functional study of cloned genes in chicken embryos, a method to introduce a foreign DNA into the embryo by electroporation has been developed . Although this method allows ectopic expression of the introduced gene in a restricted region of the embryo, its expression is transient and therefore analyses are restricted to phenomena that occur during early stages of embryonic development. To circumvent this problem, the Tol2 transposon system was recently applied to the chicken system. A plasmid DNA harboring a Tol2 construct with the GFP expression cassette and a helper plasmid containing the transposase gene under the control of a ubiquitous promoter (CAGGS in Figure 5) are co-electroporated in chicken embryos. The Tol2 construct is integrated into the genome soon after electroporation. As a consequence GFP is continuously expressed in cells that harbor the construct in the genome, and sustained GFP expression is observable until late developmental stages (Figure 5) . Chromosomal transposition of Tol2 in chicken was confirmed by Southern blot hybridization using the chicken culture cells . Thus, the Tol2-mediated gene transfer method should be useful in studying the roles played by genes that are involved in late organogenesis in chicken. This method was successfully applied to express a dominant-negative form of cadherin in the horizontal cells in the retina and to identify an essential role played by cadherin in dendritic morphogenesis . Transient expression assay in chicken. A plasmid DNA containing the transposase cDNA under the control of a ubiquitous promoter (CAGGS) and a transposon-donor plasmid DNA containing a Tol2 construct with the CAGGS promoter and the gene encoding green fluorescent protein (GFP) are introduced into the somite of a chicken embryo by electroporation. The Tol2 construct is excised from the plasmid and integrated in the genome. GFP expression in the somites persists until late developmental stages . Germline transgenesis in chickens and quails has been performed using retroviral vectors  and the mariner transposable element . Although creating transgenic chickens and quails is of great importance to developmental biology and for pharmaceutical purposes, transgenesis methods in avian species have not been well established relative to other model vertebrates . The Tol2 transposon system may become a useful tool with which to create stable germline transgenic chickens and quails as well. When a transposon-donor plasmid harboring a Tol2 construct with the neomycin resistance gene is introduced into mouse embryonic stem cells with a helper plasmid containing the transposase cDNA under the control of a strong promoter (CAGGS in Figure 6) by electroporation, the Tol2 construct transposed from the donor plasmid to the genome and neomycin-resistant colonies is formed (Figure 6) . In this experiment, the number of neomycin-resistant colonies was increased proportionally to the amount of the helper plasmid expressing the transposase, indicating that the transposase can enhance transposition in a dose-dependent manner . This is in contrast to transposons of the mariner family, including Sleeping Beauty (SB), in which a phenomenon termed overproduction inhibition (the transpositional activity is reduced in the presence of an excess amount of transposase) has been observed [34, 35]. Proportional increase in transpositional activity of Tol2 was observed in other co-transfection experiments using human cells [6, 36]. However, it is uncertain whether the Tol2 transposon system is perfectly free from over-production inhibition, because conditions used in the previous studies are still limited and it is possible that the amount of transposase did not reach the threshold at which over-production inhibition can be detected. Indeed, the transpositional activity of the maize Activator (Ac) element was decreased as the amount of the transposase increased , indicating at least that a transposon of the hAT family can suffer from overproduction inhibition. Chromosomal integration in mammalian culture cells. A plasmid DNA containing the transposase cDNA under the control of a ubiquitous promoter (CAGGS) and a transposon-donor plasmid DNA containing a Tol2 construct with a ubiquitous promoter (the phosphoglycerate kinase [PGK] promoter used by Kawakami and Noda ) and the neomycin-resistance gene are introduced into mammalian culture cells by electroporation. The Tol2 construct is excised from the plasmid and integrated into the genome. Chromosomal integration of the Tol2 construct is enhanced, depending on transposase activity . A transposon-donor plasmid DNA containing a Tol2 construct with the luciferase gene and a helper plasmid expressing the transposase were introduced into mice via the tail vein using the hydrodynamics based transfection method. Sustained luciferase expression was detected in the liver of the injected animals . Then, a Tol2 construct containing the fumarylacetoacetate hydrolase (FAH) gene was introduced into the liver of FAH-deficient mice, a model for hereditary tyrosinemia type 1. The symptoms of hereditary tyrosinemia type 1 were eliminated in mice receiving the injection. Gene delivery by the hydrodynamics-based transfection method using SB was previously reported . This work demonstrated that Tol2 could also be used as a tool for gene delivery to somatic cells in live mice. Although the SB transposon system has been applied to germline transgenesis and mutagenesis in mice [39–42], little effort has been devoted to exploiting Tol2 for such purposes in mice. It would be interesting to test whether the Tol2 transposon system can be applied to mouse transgenesis and mutagenesis. Because it was reported that the transpositional activity of Tol2 is greater than that of SB in human cells , an in vivo transposition system using Tol2 may be more efficient than the SB transposon system in mice. An exogenously introduced Tol2 element can transpose into the genome of the medaka fish as well . However, useful genetic methods using Tol2 in medaka have not been developed. This is mainly because the transpositional activity of Tol2 in medaka has been found to be low. Why is the transpositional activity low in an animal that is a natural host for the element? It was suggested that the Tol2 transposase protein may contain an extranuclear localization signal, and this may be the cause of the low transpositional frequency in medaka . However, this possibility seems unlikely because Tol2 can transpose efficiently without any modification of the transposase protein in other vertebrates, unless such a mechanism is only effective in medaka cells. There may be an unknown mechanism in medaka that suppresses the transpositional activity. Identification of such an inhibitory mechanism may be a key to rendering Tol2 useful for inducing genetic manipulations in medaka. The Tol2 transposon system has been shown to be active from fish to mammals. As described above, practical applications of Tol2 in vertebrate systems are emerging, and Tol2-mediated genetic methods have already generated fruitful results, especially in zebrafish and chicken. These studies revealed various features of the Tol2 transposon system. First, Tol2 can transpose in various vertebrates, indicating that, although host factors involved in the process of transposition of Tol2 have not been identified, such factors should be conservatively present in those vertebrates. Second, Tol2 can transpose efficiently in a variety of cell types in developing embryos (either differentiating somatic cells or germ cells). Third, Tol2 can transpose in a wide range of temperatures (25°C to 26°C in zebrafish, and 37°C to 38°C in chicken). Fourth, Tol2 can integrate almost everywhere in the genome, and there are no preferences with respect to position on a chromosome (proximal or distal to the telomere or the centromere). Fifth, no consensus DNA sequence has been observed in the 8 bp target duplications created upon integration of Tol2. This is in contrast to other transposon systems that are currently used in vertebrates; for instance, transposons of the mariner family (including SB) integrate in TA  and piggyBac integrates in TTAA . A sixth important feature of the Tol2 transposon system is that Tol2 creates single copy insertions and does not cause gross rearrangements around the integration sites. Therefore, integration sites of Tol2 can readily be analyzed by inverse polymerase chain reaction (PCR) and linker-mediated PCR. Finally, transgenes cloned on the Tol2 vector are reliably expressed in transgenic animals and cells. This may suggest that they are free from a putative gene silencing mechanism by the host, which may sometimes suppress expression of transgenes created by introduction of plasmid DNA into cells. Because the Tol2 transposon system has been successfully applied to several model vertebrate animals, it should be used as a tool to modify the genomes of other vertebrate animals as well, which are important for agricultural and pharmaceutical purposes. Also, in the future Tol2 may be used as a gene transfer vector to human cells for therapeutic purposes. I thank P Mead, Y Takahashi, and M Taira for discussion; Y Hirai for artwork and M Suster for critical reading of the manuscript. This work was supported by NIH/NIGMS R01 GM069382 and grants from the Ministry of Education, Culture, Sports, Science and Technology of Japan.